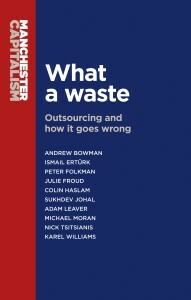 By Colin HaslamThe trend towards ever-greater outsourcing is putting vital public services in the hands of potentially unstable conglomerates but leaving public bodies with the asset risk. From the 1980s onwards, the UK government has employed contracting out to provide public services. The National Audit Office estimates that the government spends £187bn on buying in goods and services. It is difficult to separate out service outsourcing from traditional goods procurement in the official statistics but it is clear that government spending with third parties continues to expand, especially at local government level. The advocates of outsourcing view contracting out as a way to reform public services, improve efficiency and generate value for money. Outsourcing contracts are routinely announced in the press along with the claim that millions will be saved. However, the extent to which these contracts are delivering value for money and reducing costs is difficult to assess because contract details are generally withheld on the grounds of commercial confidentiality. A further complication is that local and national government agencies are contracting with outsourcers that consolidate many contracts into portfolios. These are often large conglomerates or specialist firms, some of which are British companies, others subsidiaries of foreign multinationals or private equity holding companies. This accumulation of many contracts within a few large firms forces national and local government agencies into a dependency relationship because they no longer have the operating capacity to deliver public services. This dependency is reinforced because many outsourced contracts are for the provision of foundational economy services such as health, adult care, welfare, and household waste management that are essential for a civilised life. Conglomerates like Serco or G4S manage hundreds of diverse contracts for UK national and local government agencies. Serco and G4S are in a constant struggle to find growth to secure additional profit and this means capturing new contracts, winning renewals in a competitive market, and turbo-charging growth through the acquisition of other companies. These firms chase revenue and profits but this strategy also inflates their balance sheets: liabilities in terms of debt outstanding and goodwill representing the difference between the market and book value of acquisitions. Increased pressure to win new contracts and keep delivering growth for investors has resulted in poor judgements over the choice of new contracts, what to renew and what firms to acquire. Mistakes and misunderstandings resulted in a £1.6bn write down in the value of Serco’s assets, forcing an intensive restructuring strategy. Even contracting specialists such as Biffa and Veolia are under pressure to generate financial leverage and boost shareholder returns from contracts with the public sector. Biffa, a household waste management company, had to write down roughly £1bn of debt finance to restructure its over-capitalised balance sheet. Veolia UK, another specialist operator, is under pressure from its French parent company to generate returns. According to International Public Sector Accounting Standards, off-loading responsibility for the management of contracts to the private sector does not involve transferring the responsibility for asset value risk to the operator responsible. Assets attached to an outsourcing contract will still be reported on the public sector accounts where the public sector entity either regulates the contract or can take up ownership of the assets at the end of the contract. Public sector reporting entities, as a consequence, are exposed to fair value impairment risks to these assets, which could undermine reported net worth leaving taxpayers to foot the bill (see this technical note from CIPFA). Outsourcing of public services creates new problems and risks. Public sector expertise and capacity to deliver essential services are being hollowed out. Foundational services, upon which we all depend, are transferred to conglomerates and specialists prone to financial instability and collapse. Public sector reporting entities, in the meantime, are not able to transfer asset risk associated with their outsourced contracts – leaving them exposed to impairments that could undermine their financials. Category: Business Studies, Politics	3,455 Comments.